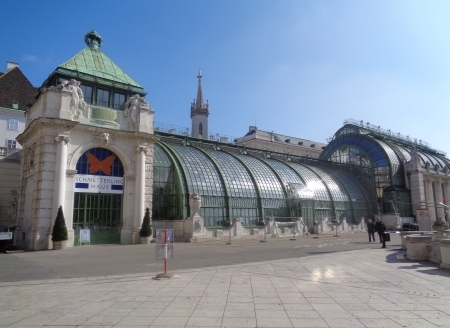 The Palmenhaus in Vienna is a more than 100 meter long house in the center of Vienna. As in a typical greenhouse, the walls and the rounded ceiling are largely made of glass. For some time now it has been divided into three parts. In the middle is a cafe, in the right part a greenhouse and on the left the famous butterfly house. The greenhouse at the Burggarten, not far from the famous Hofburg, was built at the beginning of the 19th century. In 1988 it had to be closed for security reasons. After a renovation, the Palmenhaus reopened in 1998. Since then, the Butterfly House in particular has been a new tourist attraction and sight in the city centre of Vienna. About 500 butterflies (40 butterfly species) live in the Vienna Butterfly House. They are tropical butterfly species, native species are not among them as far as we know. All butterflies occur in the wild in Southeast Asia (such as Thailand or the Philippines) or Central America (such as Costa Rica). Some species reproduce in the glasshouse in Vienna. The building is naturally heated and the animals live here all year round. Especially in winter it is interesting to visit this part of the palm house. The walk through the house with the tropical plants gives many visitors something like a holiday mood. Depending on the species, the butterflies have completely different colours and patterns. The 500 butterflies are not always easy to discover in the large, plant-rich glasshouse. Especially with children the search for the colorful insects is interesting. We think that visiting the butterfly house is a great change. 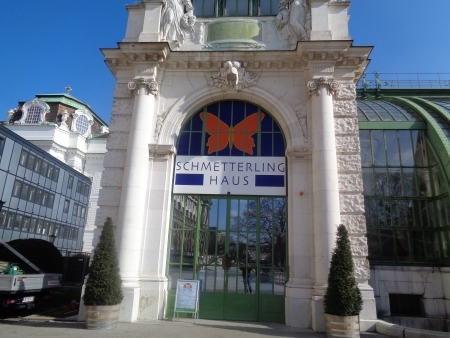 Unfortunately, in our opinion, the entrance fee to the Schmetterlingshaus is a bit too high (see below). A central location in Vienna is hardly imaginable. The Park Burggarten, the Hofburg and the Albertina Art Museum are in the immediate vicinity. The best subway station is „Volksgarten“ (subways U2 and U3). In winter (November to March): In this season the opening hours of the butterfly house are the same every day, from 10 am to 3:45 pm. To see the butterflies and the equally interesting tropical plants, an adult must pay 6.50 euros entrance fee. The entrance fee for children from 3 years is 3,50 Euro, for children from 6 years 5 Euro (also valid for students up to 26 years). There are some discounts for groups, pensioners, students, holders of the Vienna Card, etc. As far as we know, there is no family card. Thus a family consisting of 2 children and 2 adults, depending upon age of the children, must pay around 20 euro or even somewhat more entrance fee (conditions at the beginning of the year 2018). We think the entrance fees to the Butterfly House are a bit too high. You should also have a look at the restaurant in the Palmenhaus Wien (Palm House Vienna). It is a good and well known cafe and restaurant of the upper class. The food tastes excellent. Also the terrace in front of the Palmenhaus with view on the Burggarten is beautiful. There are classics such as Wiener Schnitzel or beef roulade. But you can also just have a coffee and enjoy the view. The opening hours of the cafe, brasserie and bar in the Palm House are from morning (depending on the day of the week 9 am or 10 am) until late in the evening. Breakfast is also served.